Speaking of pies, don’t forget to leave room for dessert! Made locally on Long Island, Blue Duck Bakery pies are a hit every year, so take advantage of our Thanksgiving Pie Special on Blue Duck pies between November 19th and 22nd. Our Thanksgiving dishes will be available at the Prepared Food counter of your nearest Union Market beginning on Monday, November 12th. If you’re interested in a fresh, uncooked turkey, we’ve got a great selection of antibiotic-free, humanely raised birds from local farms. Be sure to place your turkey order with our butchers by Friday, November 17th, and check out our tried and true recipe for the perfect roast turkey, one that’s crispy on the outside and tender and flavorful on the inside—we guarantee it’ll leave you licking your lips. And if you need any last-minute supplies, we’re open from 7AM until 4PM on Thanksgiving Day at all five locations. 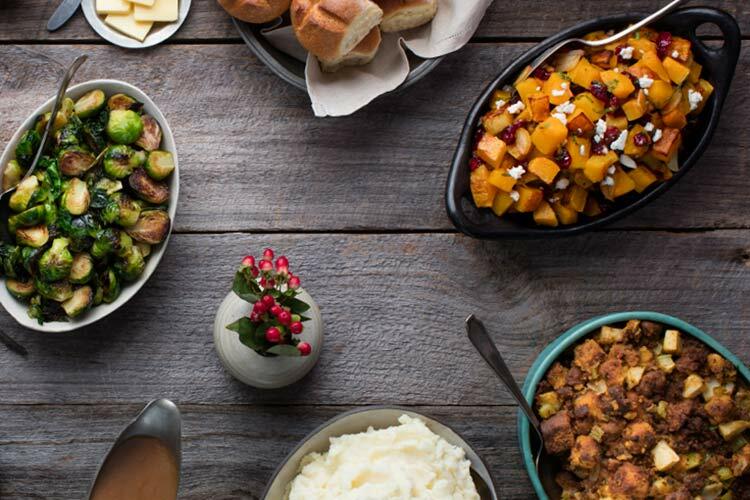 Happy Thanksgiving from all of us at Union Market! Offer good November 19 – 22, 2018. Valid for Blue Duck Bakery Pies only, while supplies last. FROM THE MAINE PIE CO. Available in our freezer section. PREVIOUS Ready for Thanksgiving? We’re here to help!